Motobecane was a French company, formed in 1923 to manufacture bicycles and motorbikes. 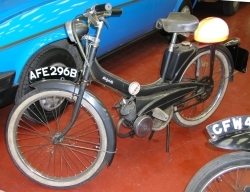 The 'Mobylette' moped was introduced in 1949, and 14 million were produced over a 49 year production run. The company was sold to Yamaha, and re-formed as MBK. This motorcycle was purchased new by a Dr Ewing of Church Lane, Bardney and its second owner was George Sumner of Wragby Road, Bardney, who purchased it with the original tank of fuel in the 1970's. He then passed it on to his son-in-law, Victor Munro of Western Avenue, Lincoln in 1981, and it was subsequently donated to the Society.